It isn't cheap and it has quirks, but it's an actual FM synth with knobs. Wonderful sounding, frighteningly deep, totally inspiring and wild to experiment with. Superb sounds. Well put together. For a certain person of a certain age, the sound of four operator FM is deeply intertwined with the hazy nostalgia of childhood. It's the sonic equivalent of the smell of cut grass, as it was little grey four operator Yamaha FM chips that, in their hundreds of thousands, created the wild gritty Rave soundtracks inside our Sega Mega Drives, which we sunk so much of the early '90s into. So we have always loved FM synths, which often seem to get the wrong end of the stick compared to 'more immediate' analogue synths, which generally do less and sell for more money. Here's an unpopular opinion: FM synthesis is significantly more 'powerful' than subtractive analogue, and arguably more surprising and exciting to explore, especially if you don't know what you're doing. FM can make a far broader range of sounds than subtractive, does it with less 'building blocks', and leads to more happy accidents. Our desert island synth would be an FM synth, so it'd be a seriously big deal to be able to control an FM voice that wasn't hidden behind a membrane panel. 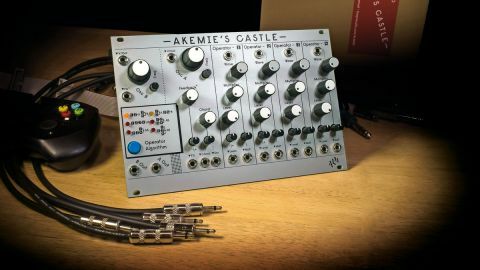 Enter Akemie's Castle, a Eurorack module which puts a new old-stock Yamaha YM262 FM-synth-in-a-chip, under 1V/Oct voltage control. It was a chip used in SoundBlaster sound cards, and is similar to those in later budget DX synths like the DX100 and DX21. Every panel setting except algorithm selection can be voltage controlled, and there are handy attenuverters on many inputs. But we don't just control it with voltages. It is peppered with ever-lusted for physical controls, with 13 rotary controls, editing algorithms chosen with a nice clicky blue button. It is that holy grail: we can program an FM voice by turning dials. For those baffled by what four operator FM synthesis is, in this instance it's just like having four oscillators (aka Operators) each with octave switches (aka Multipliers), where the rate of certain operators controls the tone of others. The routing is decided by the 'algorithm' (there are six in the Akemie's) - each good for creating different sounds. You can start with just two 'boring' old sine wave oscillators but, when the speed of one affects the other, complex waveforms are created. Now imagine each operator has a VCA to control how much it affects the other one. That's the Level control. And you don't just have boring old sine waves, you actually have eight waveforms to choose from (including square and saw), so you can make complex waveforms with less operators, and you can also self-modulate the patch's 'Feedback' adding more complexity, leading up to noise, good for making drums. Akemie's does all these things, and with voltage control and knobs. What Yamaha managed to squeeze into the little YM262 was impressive, and ALM's front end applies it interestingly. The chip's polyphonic, and Akemie's makes use of that by making it two voice, with two outputs and independent 1V/Oct inputs. Depending on the algorithm, it can act as two combos of dual two operator FM synth, or four types of split four operator. The rest of that polyphony gets used on a chord mode for output A. There is a dial which scrolls through 16 preset 2-5 voice chords, with inversion, the degree of which is dependent on how much voltage goes into an adjacent CV input. So what's it like, and what sounds can we make with it? In a nutshell, it's pretty mind-expanding to experiment with; the potential width of sound creation present in just simple four operator FM architecture, when you factor in external CV modulation and eight waveforms, is just plain scary. Feed it a sequence and some sync'd modulation, twirl the chord dial, and suddenly you're bopping out incredible and righteous '90s Rave sequences with bizarre freaky modulated overtones. It gets very Streets of Rage 2 soundtrack very quickly, which is good. It makes utterly gnarly growly DX bass sounds. Huge furry saw basses. Extraordinary, terrifying warping pads which would scare the hell out of a dancefloor. Brutal mallets, bowed metal, organs, struck glass, Selected Ambient Works pads. Crazy wild drum tones. And there are so many sounds it can make which frankly defy adjectives - sounds which most closely relate to tearing metallic objects, sonically eviscerating chiptune nightmare-fuel. Beautiful, euphoric bliss too. Under synchronised rhythmic CV modulation we can blur the lines between drum and melody. With the right modulation, it is capable of things which no existing DX synth could ever do. And all with potentiometers, at last. It sounded cleaner than we expected, but do not expect 'pristine' tones; expect to hear 'fur' on the edge of the waveforms and soft sizzly aliasing, which were quite apparent. We wouldn't really expect otherwise given its provenance; it's part of the charm. A more significant sonic fingerprint which some may dislike is a clicking 'zipper noise' when the 'Level' control changes, swept by hand or voltage. Level changes are stair-stepped with an audible click when they change. This is a limitation of the Yamaha chips, less noticeable on bright sounds vs soft. Of course you can hide this by externally low-pass filtering the voices (fun in its own right given the gritty source, filters on an FM synth! ), or use an external VCA for 'perfect' overall level control. The other important limitation to be aware of is, unlike classic DX synths, there are no envelope generators built-in. The Akemie's expects you to own a fair complement of envelope and LFO modulation to truly take advantage of its CV inputs. ALM's Pip Slope and O/A/x2 modules were created specifically to complement Akemie's Castle, though we didn't have one (or 18) present for the review - it works just fine with appropriate third-party modulation, and it's a nice touch there are so many input trimmers to fine-tune what you feed it. Lastly, there are no memories, just the live panel (the algorithm setting is remembered after power cycling). So in use, it's very 'analogue', for a digital module. What you see is what you get. And what you see is a holy grail - an FM synth with knobs. One that's elegantly designed and highly musical, voiced by a charming vintage Yamaha chip, bristling with CV control, and which is sonically every bit as exciting and wild to experiment with as you would hope. Bravo, ALM.